Willie Collins was born in Macon, Georgia, on November 26, 1922. He lived with his mother, Gussie Collins, his father, Will Collins, and maternal grandmother, Anna Riley. He attended both primary and secondary school and completed two years of college. Collins was employed as a checker at R.A. McCord Motor Company, a company that sold and serviced cars. Living in the Deep South for his entire life, he was subject to the oppressive nature of Jim Crow laws as an African-American citizen. These laws infringed upon the lives of black citizens by subjecting them to segregated housing, schools, transportation, and public accommodations. During President Franklin Roosevelt’s trips to Warm Springs, Georgia, he recognized the South’s slow urbanization rate compared to other areas of the country. The outbreak of World War II, however, served as a catalyst for Southern urbanization. The ample land, resources, and railroads in Georgia made it a hub for wartime manufacturing and training. Robins Field, a U.S. Army Air Force Base located near Macon, brought even more employment opportunities. Workers were tasked with repairing war materiel, including B-17, C-47, B-29, B-24, P-51 aircraft and radios, parachutes, aircraft technology, and spark plugs. Throughout the course of the war, the Robins Field employed 23,000 of Macon’s population of 58,000 people. The civilians’ greatest contribution to the war effort came from the coastal region of Georgia. Laborers on the coast worked diligently to build Liberty ships that were needed to support the Allied troops in the Pacific and European theaters. Through the concerted efforts of the shipyard on the Savannah River and J. A. Jones Shipyard, the Allies commissioned almost 200 Liberty ships in about two years. Collins enlisted at Fort Benning in Columbus, Georgia. At the time of his enlistment, Fort Benning was the largest infantry training school in the world. 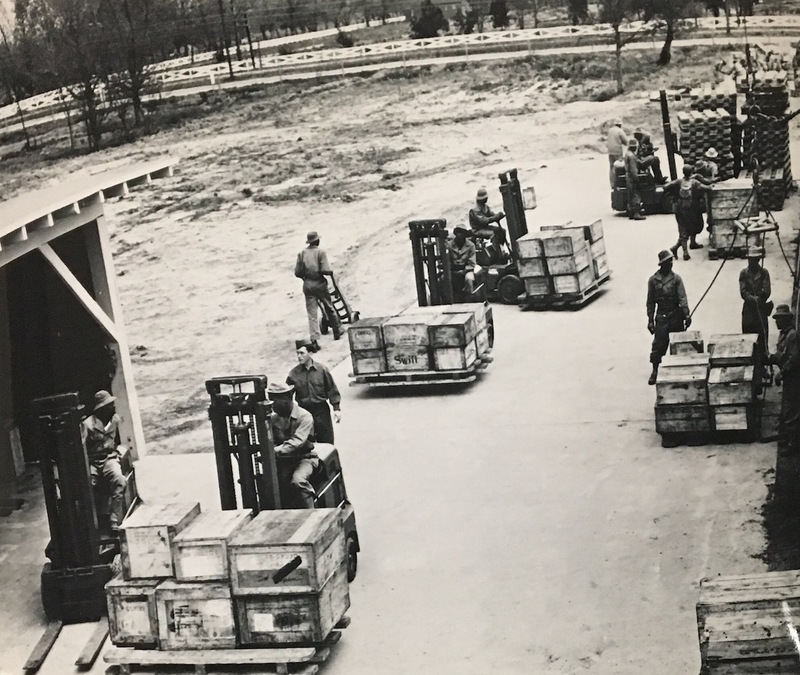 Adhering to its mission of “[producing] the world’s finest combat infantrymen,” Fort Benning has produced military greats, including General George C. Marshall, General George Patton, and General Dwight D. Eisenhower. 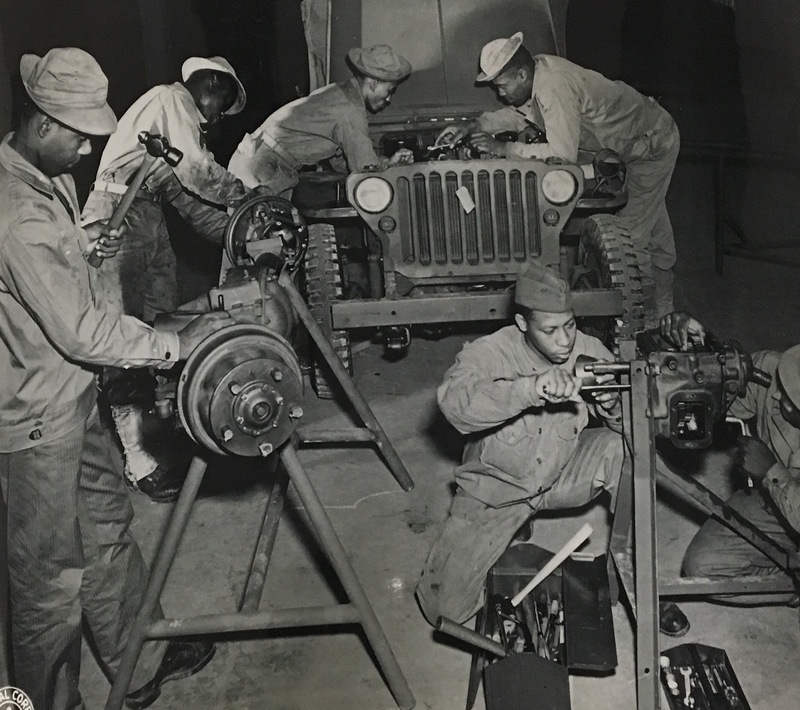 Despite the economic and military progression Georgia experienced during World War II, the state remained largely stagnant when it came to matters concerning civil rights for African Americans. Although slavery was over, racism still existed and was perpetuated through repressive Jim Crow laws. The 490th Port Battalion of the U.S. Army Transportation Corps was established on January 25, 1943, in Louisiana. The African American soldiers trained in April 1943 at the Unit Training Center in New Orleans. 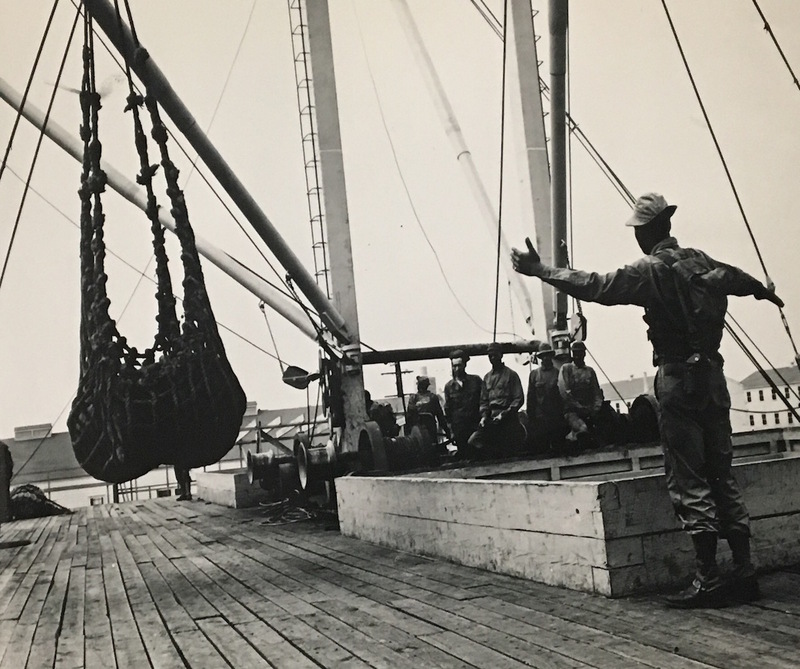 In May 1943, the 490th Port Battalion migrated from New Orleans, Louisiana, to Charleston, South Carolina, where the riggers practiced stevedore skills, loading and unloading cargo from ships. In September 1943, the group performed its first live port battalion duties under the direction of the 4th and 15th Major Port Company in England. The A, B, C, and D groups of the 490th Port Battalion were renamed 226th, 227th, 228th, and 229th Port Companies. Upon his enlistment, Collins was placed in the Transportation Corps, a subdivision of the 228th Port Company. He served with this division for 16 months. His leadership qualities allowed him to quickly make his way from a private to sergeant in little more than a year, an accomplishment that often takes years for a soldier to achieve. He also received a sharpshooter’s medal, which was especially impressive considering that he did not belong to a combat unit. The 228th Port Company was based at the Seamills Camp in Shirehampton, England, from April to May 1944. After leaving Seamills, the company moved to Harpton Court in Radnorshire, a former county located in Wales, on May 19, 1944. While it is common to hear that the war fostered camaraderie among enlisted soldiers, black soldiers did not always get a chance to participate in this type of companionship. Racial tensions prevalent at home were also evident within the armed forces. Often white Allied soldiers would share a meal with a German prisoner of war before they would with a fellow black soldier. The hostility that black soldiers faced, however, did not deter them from striving to complete the Double V campaign, a plan that sought to restore democracy in parts of Europe while also fighting to extend the full benefits of democracy to African Americans in the United States. In the early hours of June 6, 1944, the 490th Port Battalion hit Utah Beach, under the direction of the 531st Engineer Shore Regiment. The shores of Utah Beach contained deadly traps that formed the Atlantic Wall, a barrier created by the Germans to deter Allied forces from attacking the beaches. The 490th Port Battalion cleared beach obstacles, prepared exits on the beach, and assembled spots on the beach that Allied forces could use to deter opposing forces. The efforts of this unit and others led to the liberation of the harbor of Cherbourg and ultimately the nation of France. The concerted efforts of Allied units on D-Day, June 6, 1944, were the first steps towards ending German control in Western Europe. 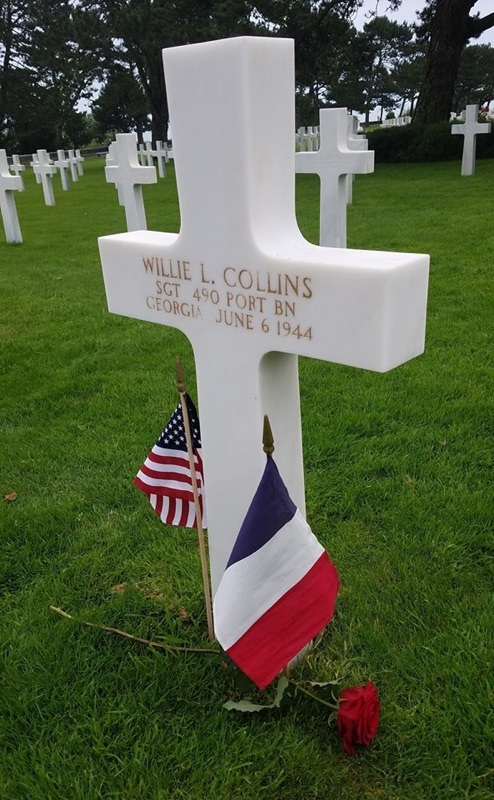 German artillery fire, a devastating force used against the Allies, killed Sergeant Willie Collins while he unloaded supplies onto Utah Beach. He was the only man from this unit killed on D-Day and was awarded with the Purple Heart posthumously. Although Sergeant Collins did not live to see the accomplishments of his compatriots from the 490th Port Battalion, he would be proud to know that his men were showered with accolades, including the Croix de Guerre and the Bronze Arrowhead awards. The fight for democracy was an experience that differed for white and black soldiers. White soldiers sought to restore democracy in European countries where democratic principles had been forcefully uprooted. Black soldiers, on the other hand, sought not only the restoration of democracy for Europeans but also for African Americans, who were not afforded the same core benefits of democracy as their fellow citizens. During World War II, over one million black soldiers served a military and a country that failed to serve them. Despite the animosity that black soldiers faced on the homefront and overseas, they continued to put their lives at risk to protect democratic principles that were seldom extended to them. One of these brave soldiers was Sergeant Willie L. Collins, a man who transcended boundaries on and off the battlefield. Collins was born on November 26, 1922, to William and Gussie Collins. He and his parents along with grandmother lived in Macon, a small town located in middle Georgia. Collins had a non-traditional academic life, attending all of primary and secondary school and finishing two years of college. With the outbreak of World War II, the rural town of Macon had become increasingly industrialized. Over 16,000 people flocked to the factories of Macon, eager to serve their country by helping out in any way possible. Collins decided to show his pride for his country by voluntarily enlisting on February 2, 1943, at Fort Benning. Collins was killed by German artillery on D-Day while unloading cargo onto Utah Beach. He was the only reported casualty on D-Day from his unit. Collins received a Purple Heart posthumously to signify the valor and leadership he presented while serving. Sergeant Collins used his life to test and transcend boundaries that had been placed in his way. He took paths not often traveled as a way to better himself and those around him. As a soldier, Collins used World War II as a tool to fight against two evils that existed in the world: fascism and racism. The sacrifice of Sergeant Willie L. Collins and the other over one million African American soldiers who served in World War II led to the eradication of fascism in Europe and served as a catalyst for the Civil Rights Movement, ultimately securing democracy for both Europeans and African Americans. Exploring different perspectives was a concept that was encouraged throughout the Normandy: Sacrifice for Freedom® Albert H. Small Student & Teacher Institute. This was evident in the readings, as we explored the lives of Jewish people during the Holocaust, to Japanese-Americans retaining their patriotism even while being forced into internment camps, to the French on the homefront. This emphasis on exploring the war from different perspectives is what encouraged me to choose Sergeant Willie L. Collins, an African-American soldier. Uncovering the life of Sergeant Willie L. Collins has been a semester-long journey of frustrating dead ends and rewarding breakthroughs. One of the most remarkable experiences I had on the trip was our visit to the National Archives in Maryland. Prior to the Normandy trip, I did most of the research digitally, but going to the Archives brought tangibility to the research that I appreciated. I was no longer learning about the life of my Silent Hero through incessant Google searches or by scouring Ancestry, but I actually viewed and touched documents, maps, and pictures pertaining to the life of Collins. For the first time, I saw photos of Collins’ unit, the 490th Port Battalion, in action, which helped to round out my research. 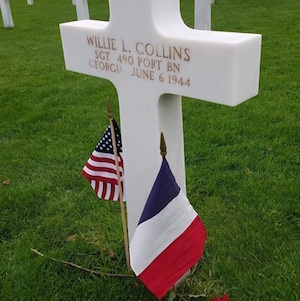 Having my research experience culminate with visiting the Normandy American Cemetery to eulogize Collins was an experience that cannot be truly conveyed with words. The white marble graves that stretch for miles at the Normandy American cemetery can appear monotonous at the surface. After researching one of these fallen soldiers for months, it was interesting to know that, despite the uniformity on the surface, each of these fallen heroes had a different story and background. It was truly an honor getting to unearth the story of Sergeant Willie L. Collins and discovering who he was as a citizen, a soldier, and a leader. 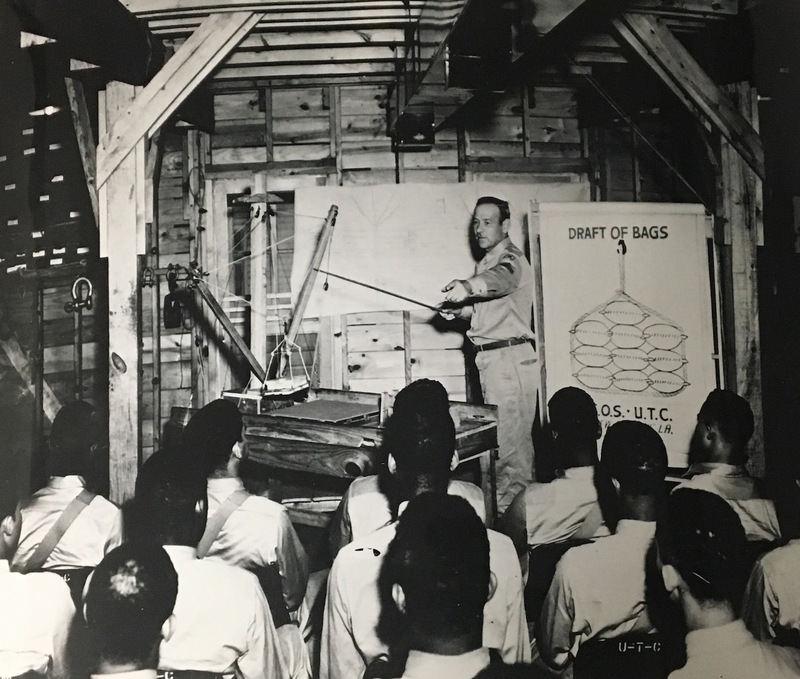 A class in motor maintenance at a Unit Training Center. Proficiency certificates are given to those who successfully pass the course. Photograph. June 1943. National Archives and Records Administration (172168). A class at a Unit Training Center. Proficiency certificates are given to those who successfully pass the course. Photograph. June 1943. National Archives and Records Administration (172167). 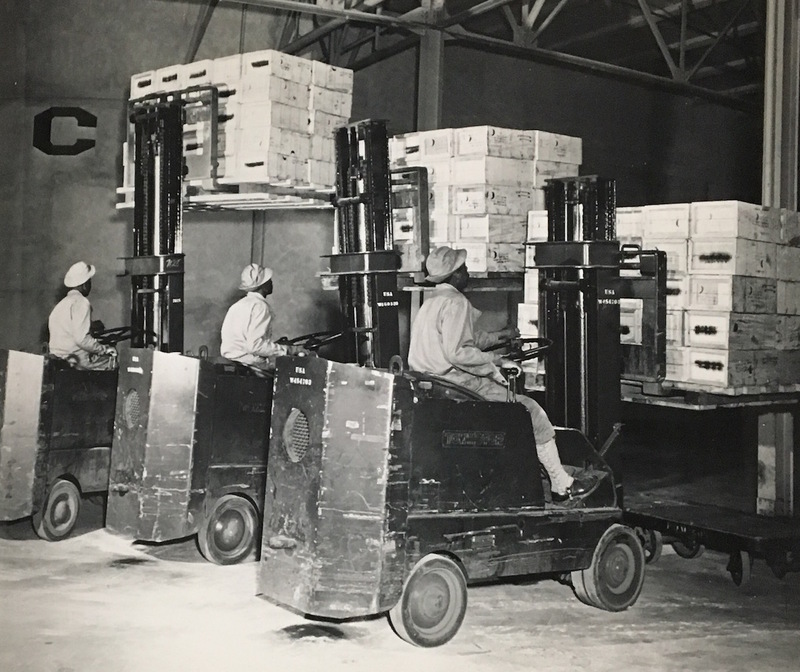 Soldiers training at a Port of Embarkation...Finger-lift trucks are used extensively in loading of cargo ships by Port Battalion. Army Officials believe knowledge concerning operation of such equipment will be useful to colored soldiers after the war. Photograph. June 1943. National Archives and Records Administration (172165). Soldiers training in a Port of Embarkation...Members of a Port Battalion are shown operating a fleet of finger-lift trucks alongside a dry land ship. Photograph. June 1943. National Archives and Records Administration (172163). Soldiers training at a Port of Embarkation...The photo shows a signalman, member of the Port Battalion, aboard a dry land ship, where colored soldiers are taught marine cargo handling and machinery operation. Photograph. June 1943. National Archives and Records Administration (172164). Foreign Soil, 1942-1949. Accessed March 31, 2017. http://ancestry.com. "Willie L. Collins in the U.S., World War II Army Enlistment Records, 1938-1946." Accessed March 31, 2017. http://ancestry.com. "Allies invade France." History. Last updated 2009. Accessed March 10, 2017. "Bell Aircraft." Georgia and World War II. Last updated May 4, 2011. Accessed April 5, 2017. Bone, Danielle. "War Time in Macon, Georgia." Macon, GA Restaurants, Events, Hotels & Attractions. Last updated August 9, 2016. Accessed March 27, 2017. https://www.maconga.org/blog/post/war-time-in-macon-georgia/. “Willie L Collins.” American Battle Monuments Commission. Accessed February 2, 2017. https://www.abmc.gov/node/407811#.WXqos1KZO5w. "World War II and Georgia." Today in Georgia History. Last updated December 31, 1970. Accessed March 10, 2017. http://www.todayingeorgiahistory.org/content/world-war-ii-and-georgia.